David Requiro | The Chamber Music Society of Lincoln Center. 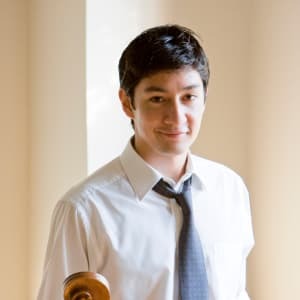 First Prize winner of the 2008 Naumburg International Violoncello Competition, David Requiro (pronounced re-KEER-oh) is recognized as one of today’s finest American cellists. After winning First Prize in both the Washington International and Irving M. Klein International String Competitions, he captured a top prize at the Gaspar Cassadó International Violoncello Competition in Hachioji, Japan, coupled with the prize for the best performances of works by Cassadó. He has appeared as soloist with the Tokyo Philharmonic, National Symphony Orchestra, Seattle Symphony, and numerous orchestras across North America. His Carnegie Hall debut recital at Weill Hall was followed by a critically acclaimed San Francisco Performances recital at the Herbst Theatre. Soon after making his Kennedy Center debut, he completed the cycle of Beethoven’s cello sonatas at the Phillips Collection in Washington, DC. He has performed with the Chamber Music Society of Lincoln Center, Seattle Chamber Music Society, Jupiter Symphony Chamber Players, and is a founding member of the Baumer String Quartet. The Chamber Music Society recently appointed him to The Bowers Program (formerly CMS Two) beginning in the 2018-19 season. In 2015 Mr. Requiro joined the faculty of the University of Colorado Boulder as an assistant professor. He has previously served as artist-in-residence at the University of Puget Sound and guest lecturer at the University of Michigan. His teachers have included Milly Rosner, Bonnie Hampton, Mark Churchill, Michel Strauss, and Richard Aaron.